Cloud POS (CPOS) is a Web application that runs in the context of a Web browser; therefore, the Cloud POS does not have offline functionality. Cloud POS is designed to be paired with a hardware station that's located on-premise in the retail store. This will allow the Cloud POS device to act as a clienteling station for retail sales associate customer-assisted sales, either mobile or from a fixed kiosk location. Modern POS (MPOS) is a POS app for PCs, tablets, and phones. Sales staff can process sales transactions and customer orders, perform clienteling activities, and perform daily operations and inventory management on mobile devices anywhere in the store, and also at PC-based registers. MPOS, unlike the Cloud POS, Modern POS can go into an offline mode when a retail server is unavailable, containing its own offline database. Therefore, if the connection to the retail server is lost, Retail Modern POS automatically switches to the offline database mode. During a sales transaction, if a data request doesn't succeed within the time allocated interval, then it is configured to go into an offline profile. Retail Modern POS automatically switches to this offline database to continue the sales transaction. When POS device is in an offline mode, it will try to reconnect to the retail server. After the reconnection is established, it will update its system and resync. The reconnection attempts occur over at the beginning of the transaction. To enable offline support for a POS device or register, we want to make sure we set the offline option to yes on the registry setup. A new channel database entity is created and added to the store's channel database group, then run at the required distribution schedule and generates a data package for the offline database. We will set up several components to define the relationships among a store, the POS registers in the store, and the retail peripherals that those registers use to process transactions. We will also define the characteristics of a specific instance of the POS. These characteristics include the hardware profile or set up for retail peripherals that will be used at the register, the store that the register is mapped to, the visual experience for the user who signs in to that register, and the functionalities that are enabled in the register. You will also define whether the register can operate in a disconnected or offline state. Users of Retail Modern POS and Cloud POS can perform various retail tasks on supported laptops, tablets, and phones. These tasks include Processing sales transactions; viewing customer orders; managing daily operations and inventory; and viewing role-based reports. Both Retail Modern POS and Cloud POS are available in Microsoft Dynamics 365 Finance and Operations. 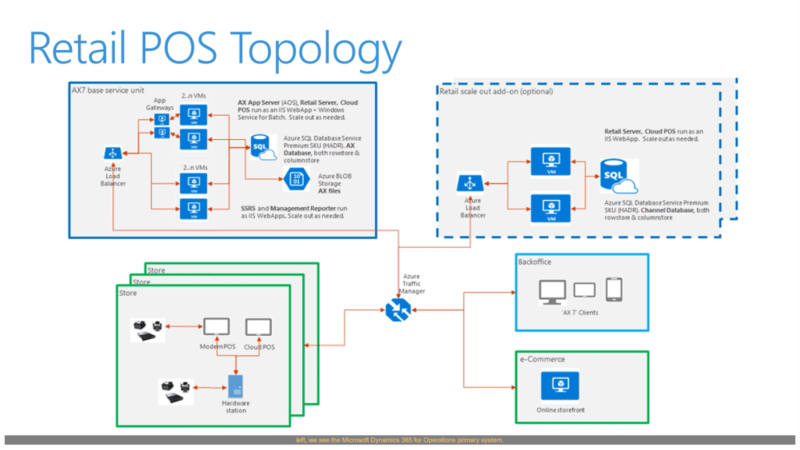 The following diagram shows the high-level Retail POS topology. In the top left, we see the Microsoft Dynamics 365 for Operations primary system. The system is located in the Microsoft Azure Cloud. To the bottom left, we see the channel and store locations which house various components such as the Modern POS, Cloud POS and hardware stations with peripherals. These also will be communicating to the retail server at the store location or an optional retail store scale unit represented in the top right which would be at their location. To the bottom right, we see the other connectivity that take place, such as Microsoft Dynamics 365 for Operations employees and staff in the back office, and, of course, e-commerce sites and locations. 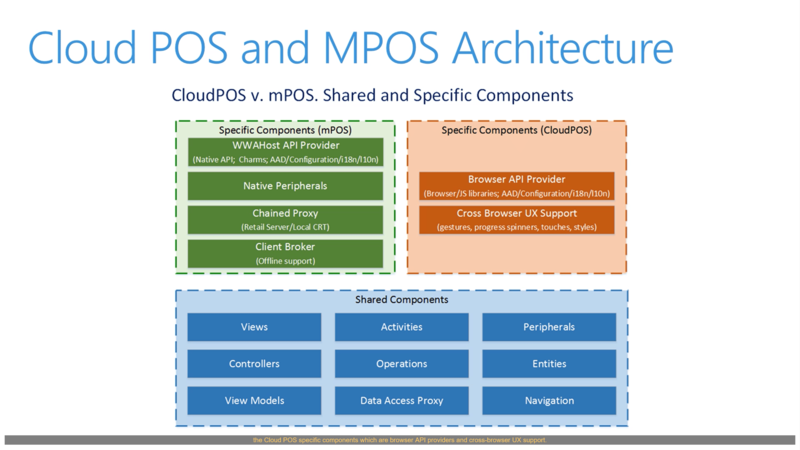 The illustration above here shows our Cloud POS and Modern POS architectures. The Cloud POS versus the Modern POS components are listed here. We'll see that there are specific components directly for the MPOS located such as native peripherals, chained proxies, client brokers and, of course, API host providers. On the right-hand side, we see the Cloud POS specific components which are browser API providers and cross-browser UX support. Below, in the blue, we see all of the shared components. As you can see, the Modern POS and the Cloud POS pretty much function in the same way. One exception: The Modern POS actually has its own native offline database functionality. So should there be an intranet connection that is broken, then the Modern POS can still perform various functions primarily for transactional purposes, where at the Cloud POS we'll be completely disconnected. 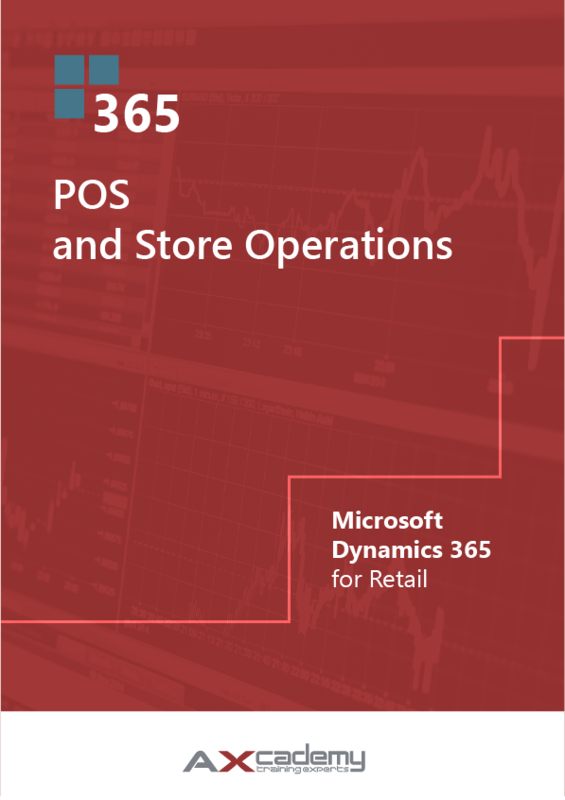 The above text is an excerpt from our training material POS and Store Operations in Microsoft Dynamics 365 for Retail, available in our webshop.